This page allows you to configure Windows, dialogs and wizards. Summary: Easy2Sync can show a summary after the sync. Show only on problems: You may configure Easy2Sync for Outlook to display a summary of the synchronization only if an error occurred. Total summary: This applies if you run several tasks at once. You may configure a total summary to be displayed, or only summaries for individual tasks. Messages by action: If this option is activated, Easy2Sync for Outlook will (if there are any messages) show the synchronization overview. This dialog summarizes all questions in groups and allows you to make decisions for the entire group. 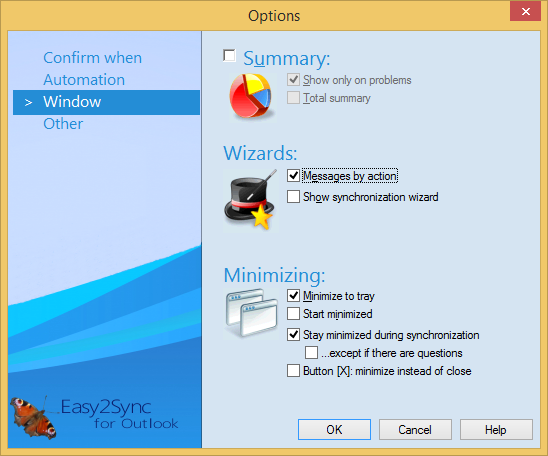 Show synchronization wizard: If this option is activated, Easy2Sync for Outlook will (if there are any messages after synchronization overview dialog) start the synchronization wizard. It will ask if the recommended action should be executed for every single file. Minimize to tray: If you minimize Easy2Sync for Outlook, you may toggle whether it be minimized normally or into the “Tray,” near the system time. Start minimized: Easy2Sync for Outlook may be started minimized; for example, you want to start it together with Windows. Stay minimized during sync: If a synchronization starts while Easy2Sync is minimized (for example, because of the timer or the tray’s popup menu), then the synchronization windows will stay hidden. ...except if there are questions: This option refers to the previous option. If a situation occurs where user interaction is required, the windows will appear nevertheless. If you deactivate this option, the windows will not appear, but the affected objects will not be synchronized either.